One lesson derived from coverage of the 2012 presidential campaign is that despite being viewed as anachronistic political pageants, some traditional set piece campaign events still have the potential to dramatically reshape a presidential race by changing the mainstream media narrative. In 2012, campaign coverage was significantly affected by several such events. That began with the conventions. Both candidates enjoyed a bounce in the mainstream narrative the week of their nominating convention. The numbers also suggest the advantage of having the second convention. Romney’s convention bounce in the press ended abruptly when the Democrats met in Charlotte one week later. Obama’s continued for another three weeks. 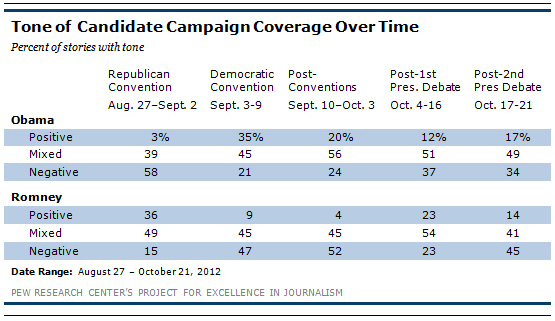 Even with his convention bounce, there were underlying doubts in the coverage about whether Romney could win. Horse-race coverage about Romney during his convention was mixed, with 20% favorable and 18% unfavorable. Obama’s horse-race coverage during his convention week was twice as positive as Romney’s, with 39% favorable and 13% unfavorable. The perception that the Democratic convention-highlighted by a much-lauded speech from former President Bill Clinton-gave Obama’s campaign a lift was reinforced by national surveys that showed the president expanding his narrow lead. The real bounce in coverage for Obama came not the week of his convention, but afterwards, and not from a rise in his coverage, but in spreading skepticism about Romney’s chances as journalists tracked the trajectory of opinion polls. Indeed, from September 10, after the Democratic convention, until the first debate in Denver on October 3, 52% of the stories about Romney were clearly unfavorable in tone while just 4% were positive- a differential of 13-to-1. Obama’s coverage during this period, by contrast, was noticeably better, with 24% unfavorable stories compared to 20% favorable, and 56% mixed or neutral. Several significant elements appeared to be in play, in addition to the polls. Many analysts concluded the Democrats had staged a more successful event that the Republicans. "The inside, bi-partisan buzz among long-time convention pros is how the Dems have become the party that knows how to stage these extravagant set pieces for maximum advantage, and the GOP has seemingly lost its golden touch," a September 7 story in Politico said. Social media participants seemed to agree. A September 28 PEJ report found that Obama’s and Clinton’s convention speeches were viewed three to four times more often on YouTube than Romney’s convention speech. The most popular GOP convention video was of an event Romney might have regretted, Clint Eastwood’s debate with an empty chair. Then came the September 11 attack on the U.S. consulate in Libya that killed Ambassador Chris Stevens. In the first confusing hours, Romney "came under withering criticism for distorting the chain of events overseas and appearing to seek political advantage from an attack that claimed American lives," when he attacked the administration’s handling of the situation before the full extent of the facts were known, the New York Times reported on September 12. A week later, September 17, a video surfaced of Romney at a private fundraiser stating that the 47% of Americans who pay no income tax see themselves as victims and would never vote for him and it was not his job to worry about those people. The revelation immediately put the Romney camp on the defensive and became part of the Obama team’s advertising campaign. That week, fully 61% of Romney’s coverage was negative, the highest point of negative coverage for the eight weeks studied. His positive coverage was at 3% that week. All this coincided with most polls showing Obama opening up a modest but solid lead of 3 to 4 points. In this difficult period for Romney, (September 10-October 3) most of the negative media narrative about him was related to his horse-race coverage. In those three-and-a-half weeks, the tone of Romney’s horserace coverage was overwhelmingly negative (69% compared with only 2% positive.) For Obama, the situation was reversed, with positive horse-race coverage exceeding negative by almost 3-to-1. Foreign policy also jumped to its highest point as a policy concern during this period, accounting for 12% of the campaign coverage. Neither candidate benefited from the issue, however. Indeed, both candidates suffered equally in the coverage, which was 4% positive and 49% negative for Obama and 4% positive and 48% negative for Romney.